I noticed there are two websites, both offering price plans but seemingly offering slightly different services. 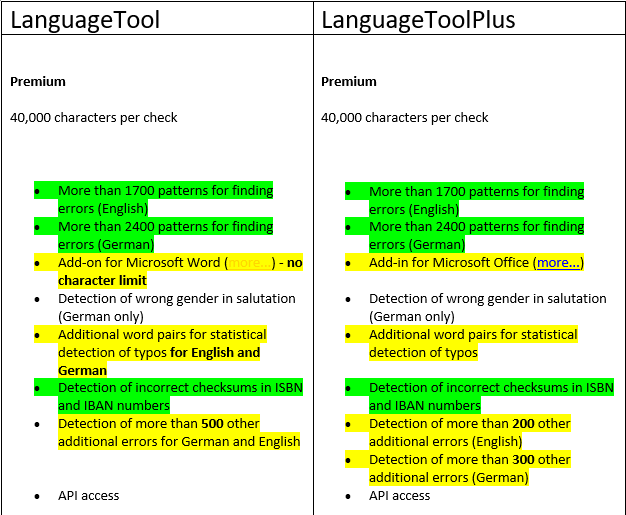 What is the difference between LanguageTool and LanguageToolPlus? Most differences are listed in the table at https://languagetool.org/#Price. Plus, languagetoolplus.com offers a personal dictionary. Thank you, however it is still unclear to me. When comparing the two for the premium package, when looking at the differences there doesn’t really seem to be a difference or it is not clearly stated what the difference is (see below). Is the personal dictionary the only difference? And what is the reason for two different websites/offerings? Are they different organizations? Do they make use of the same dictionaries/servers/backend? There’s a free version and a premium package. The premium package lives only on languagetoolplus.com. So if you buy the premium package you’ll end up on languagetoolplus.com anyway. The small differences are just because the wording hasn’t always been updated for every small change. Ah ok. Just a last question about this. On LanguageToolPlus it states the following (see picture); however I thought it also supports Dutch and some other languages as well? Of are the proofreading capabilities limited for these other languages? Thanks again Daniel. I’ve changed the headline now - LanguageTool Plus supports all languages supported on languagetool.org, but currently only English and German have additional error detection rules.